Located on former railroad rights-of-way, the MCT Trails form a series of interconnecting loops that allow trailgoers to run, bike, rollerblade or jog seamlessly from one trail to another without seeing the same scenery twice. Seven loops of varying distances (10 miles, 15.3 miles, 17.6 miles, 22.9 miles, 25.7 miles, 26.1 miles, 31.1. miles) make the MCT Trail system unique. 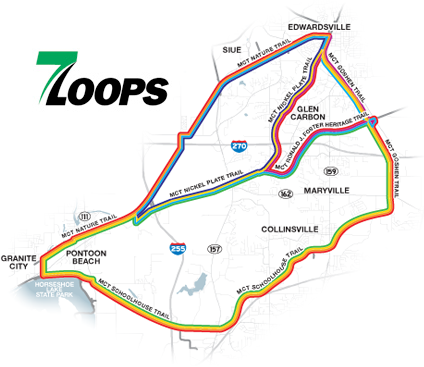 Click on the map below for access to an interactive map highlighting the seven MCT Trail Loops. To explore the loops on-line, click the “Google Trail Map” button located above.